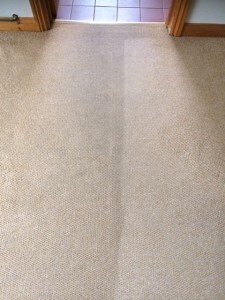 Carpet cleaning has been around for many years and for most of that the techniques employed have gone unchanged. The equipment has improved but the chemicals used have barely changed. At The Rutland Cleaning Company we are at the forefront of cleaning using the latest detergent free, free rinsing cleaning solutions for the finest and safest cleaning available. So what difference does it make to me? you may ask. Well, most cleaners still use old fashioned detergents. They work by injecting detergents into your carpet and then sucking them out using an extraction machine. As the cleaning and rinsing fluid is the same then inevitably some of that cleaning fluid will be left in your carpets. As these fluids are normally strongly alkaline, in order to clean in the first place, then it is these alkaline residues that are left in your carpet. Such strong chemicals can have effects on young children, pets and those with delicate skin or with breathing difficulties. Cleaners using this old fashioned technology will often advertise that they use old fashioned ‘truckmounted’ extraction machines as if that provides them with an advantage. the reality is that they need the maximum suction available so as to minimise the chemicals they leave in your carpet as all their cleaning takes place in that short period of time between the injection and sucking out of the chemicals. So, how are we different. We utilise modern microsplitting technology which separates the soil from the carpet fibre, is free rinsing with plain water and leaves no residue in your carpets. Our techniques mean that we put down light pre-spray of our eco-friendly cleaning solution, which is then brushed into the carpet to ensure that all fibres are covered. It is at this stage that the cleaning takes place. The photo above shows a soiled carpet where we have pre-sprayed and then gone over with our special counter-rotating brush machine, and you can clearly see that the solution has separated the soiling from the carpet fibres. We then simply extract using just plain water leaving no residue whatsoever in your carpets.